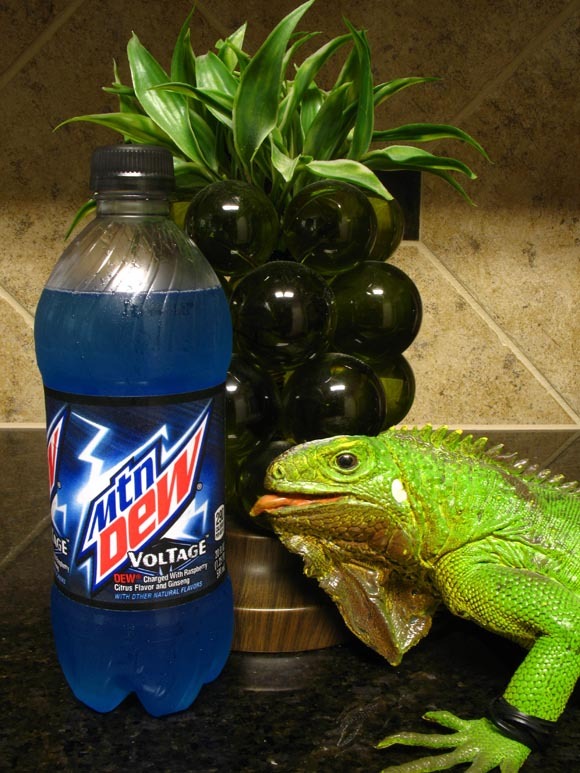 At the time I bought this bottle of Mtn Dew Voltage I was running out of drinks… I still am but that’s beside the point. I’ve never really been into the whole crazy Mtn Dew flavors thing, but I respect what they’re doing. What caught my attention to this bottle of Mtn Dew Voltage (which this point on will be called simply “Voltage”) was the fact that it contains Ginseng. Voltage immediately starts to slide down the grading scale with the words “Charged with Raspberry Citrus Flavor…” on the side. First off this drink is blue and a primary flavor is Raspberry. I dislike the idea of blue raspberry anything. Secondly what is a “Raspberry Citrus” flavor? To find that out I guess I actually have to consume it. Alright then. Here we go! Voltage smells as if you crushed up a bunch of blue raspberry SweeTarts and mixed it with the appropriate ratio of water. Needless to say I’m not impressed. I will say that the lightning bolt on the side of the bottle keeps catching my eye though. So much power. So much responsibility. Let’s see if this will live up to its responsibility like Spiderman or fail miserably like Spiderman 3. Rushed Venom, Emo-Peter Parker, and Kirsten Dunst as Mary Jane… that’s what ran through my head as I finished taking that sip. So much disappointment. Voltage hit’s your mouth with a small shock of carbonation leading up to a taste that can only be described as chemical. I’m sure there are other descriptive terms I could have used but I had to say there wasn’t for dramatic effect. The blue raspberry fights with the ginseng on who will be the most prominent flavor while Citrus sits in the corner shouting. Ultimately my mouth declares them all losers and tries to drink its problems away only finding that the nearest drink is more Voltage. Such a vicious cycle. This is the first Mtn Dew beverage that tastes like a mediocre to bad energy drink. I like original Mtn Dew (although Sun Drop is better), I like Code Red, and I like Pitch Black, but this is not worth finishing. The only reason I’m not going to rate this Do Not Buy is because I could actually finish it if I wanted to. WHY DID I JUST TAKE ANOTHER SIP?! WHAT IS WRONG WITH ME?! Oddly enough if Twist puts his tongue to it, the bottle will be shocked.